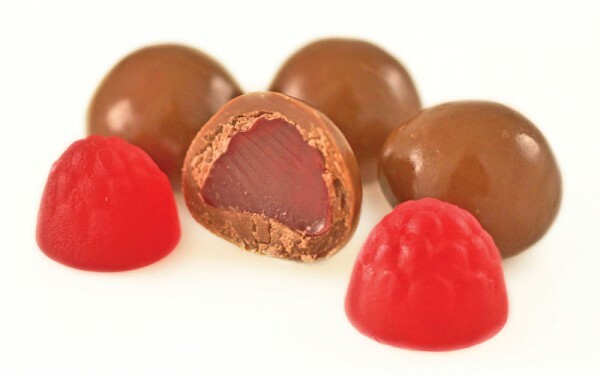 Australian made raspberry jelly coated in smooth milk chocolate. Milk Chocolate (sugar, milk solids, cocoa butter, cocoa mass, emulsifiers (soya lecithin,476), natural vanilla). Raspberry confection (19.8%) glucose syrup), wheat, starch (wheat), water, acid regulator (sodium citrate), food acid (citric acid), humectant, (glycerine), gelatine, flavour, colour (122), vegetable gum (414, 440a), anticaking agent (553B), glazing agent (904). Milk chocolate contains cocoa solids 27%, milk solids 24%.Contains milk, soy and gluten. May contain traces of nuts.